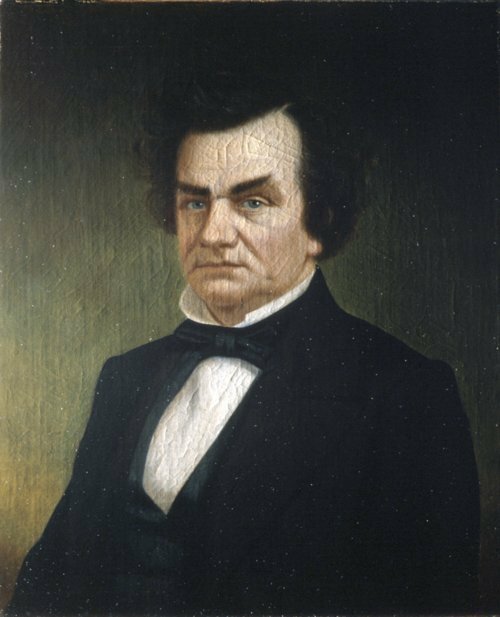 Portrait of Stephen Douglas by Louis Lussier. Douglas helped write the Kansas-Nebraska Act, which called for the repeal of the Missouri Compromise of 1820. Kansas and Nebraska were opened up for settlement but the people living there, not the national government, would determine whether these states would be free or slave. Douglas had been a member of Congress and a United States Senator from Illinois from 1847 until his death in 1861. He was the Democratic Party nominees for President in 1860 and ran, unsuccessfully, against Abraham Lincoln. He had defeated Lincoln two years earlier when both were running for U.S. Senator from Illinois and when they had their famous Lincoln-Douglas debates.